The Damo Table Lamp is named after a legendary Buddhist monk who spent nine years in solitude in a quest to reach enlightenment. The design is powerful in its simplicity, paying homage to an inspiring figure from the past by using geometric inspired forms and minimalism. A cylinder acts as a base and holds the integrated on-off button. The upper section has a cone shape and smooth top; as it is flexible, it can be moved downward or upwards, revealing two lighting bulbs underneath. Elegant and modern, this table lamp will look perfectly at home in a chic bedroom or a modern living room. 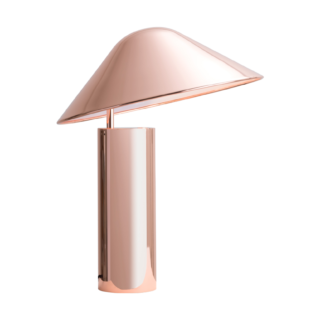 The Damo Table Lamp is made by Seed Design from durable steel and comes in two color options: gleaming copper and matte black. Gessato is an authorized retailer of Seed Design Lighting products. We purchase all of our Seed Design Lighting products directly from the company in order to bring you genuine items that represent the best in contemporary design. Every Seed Design Lighting product in the Gessato shop is authentic, comes with official brand packaging, manufacturer’s warranty (where applicable), and is sold with Seed Design Lighting's authorization.